The Transboundary Elephant Research Programme represents the South African branch of Save the Elephants. The research extends across Great Limpopo Transfrontier Park, presently continuing as Elephants Alive. 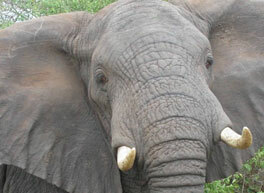 The project officially started in 2003, but draws on data collected over more than a decade thereby representing a long-term study, focused on understanding the motivation behind elephant movements from core conservation areas such as the Kruger National Park (KNP) to the North (Zimbabwe), the East (Limpopo National Park in Mozambique) and the West (Associated Private Nature Reserves). Previous and ongoing research efforts have resulted in an extensive individual elephant identification database for the western (more than 1500 elephants identified since 1996) and the northern study site (more than 100 bulls and 11 independent breeding herds have been identified since 2008). They have obtained an improved understanding of elephant ranging behaviour through the collaring and recollaring of 53 elephants during 75 collaring operations in the western, eastern and northern regions of the KNP. A long term database of elephant impact on selective trees started in 2004 in order to monitor changes in the survival rates of large trees over time and the consequential influence that these changes may have on other species (tree nesting birds). The project monitors 2971 individually labelled trees to determine their survival rate. Since 2008, 62 large trees used by southern ground hornbills and 102 trees used by raptors and white backed vultures as nesting sites are being monitored to understand the influence of elephant impact on these nesting sites. They also experiment with large tree protection methods (wire netting) to foster positive human-elephant interactions as large trees are of aesthetic importance to landowners, tourists and managers alike. The project believes that a sound scientific basis is important in wildlife management and scientific endeavour should also partly be dedicated to education and action pertaining to environmental issues. They involve local people at grass roots level in research and education to develop a conservation ethic based on local knowledge and elephant needs. Their community outreach programme, which promotes conservation amongst local children on the periphery of conservation areas, has hosted five Bush School Programmes in the Timbavati Private Nature Reserve since 2007.